Impressionistic social fresco and enigmatic political allegory, Kleber Mendonça Filho’s Neighboring Sounds resembles Lucrecia Martel’s masterpiece The Headless Woman in its portrait of masters whose solicitude toward servants quickly shades into class condescension, and of an insular bourgeoisie that has repressed its country’s recent violent history, expunging the past by burying or building over it. (Martel’s governing metaphor involves archeology and amnesia, Mendonça’s architecture; i.e., the proliferation of high rises built over demolished neighborhoods.) Though contemporary in setting, Sounds begins in the past and ends there. A montage of black-and-white photographs initiates the film, period images of sugar cane field workers, exploited camponeses who may or may not have included Antonio, Clodoaldo’s father. We can only guess at which class Antonio belonged to, or at the nature of his unhappy fate, which occurred, as his embittered son reports at film’s end, on April 27, 1984. That year marked the last of the two-decade reign of torture and anti-Communist terror by the military regime that ruled Brazil before the advent of democracy so seems, in this intricately onstructed film, not insignificant. Whatever happened in 1984 involved Francisco Oliveira, the plantation owner who has since transformed into the affable white-maned patriarch of the street in Recife where the film takes place, most of which he owns. Though he appears content to while away his dotage in an art-and-objet filled aerie, Francisco continues to exert his power as an imperious senhor de engenho, pulling strings, for instance, to shield his criminal grandson inho. (The latter’s extraordinary paleness is one of the film’s subtle signifiers of Brazil’s racial history and its configuration in class hierarchy.) What Francisco did to Antonio three decades before is left unstated, but from that ellipsis emerges a metaphor. The security team that imposes itself upon the film’s uneasy enclave pledges protection but harbors a plan for incursion, in which events of the past will rupture the “peace of mind” promised to the oblivious citizens. The repressed returns as vendetta. Much as he admires the leftist Cinema Novo of the sixties, Mendonça urges a new aesthetic for Brazilian film that reflects his country’s growing prosperity and the middle or upper class origins of most of its directors. 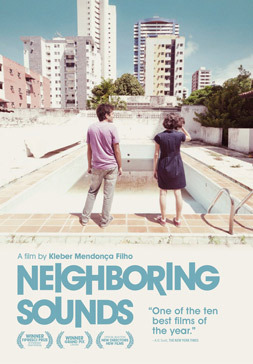 As attentive to race and class as Neighboring Sounds is, its setting—the upscale, sequestered Setubal district, where Mendonça himself lives—lies far, as Dinho manically insists to Clodoaldo, from the favela, the impoverished locale favored by filmmakers who adhere to Cinema Novo master Glauber Rocha’s “aesthetics of hunger.” Mendonça’s widescreen images, composed to incorporate as much environment as possible, emphasize the “landscape of straight lines and right angles,” the “dehumanized” city of relentless high rise development lamented by the narrator of Mendonça’s early mockumentary short "Cold Tropics". That João, the most conventionally decent bourgeois in Sounds, sells real estate, including properties owned by his powerful grandfather, complicates our sense of his integrity. (Nothing in this film is what it first appears; even the stolen CD player turns out to be the wrong one.) João’s casual mention of a maid’s room with a window during a sales pitch recalls the discussion of “this Brazilian architectural phenomenon” in 'Cold Tropics," where the stifling, usually windowless service area where the maid dwells is described as “a legacy from slavery, a ghost of the senzala era.” In Mendonça’s cinema, every space comes socially coded. One of the film’s more symbolic objects is a soccer ball that ends up punctured and deflated when Bia accidentally runs over it with her car. The accident registers with her watchful daughter, but not with the heedless driver. Like the campesino Vero may or may not have hit and killed in The Headless Woman, the boy with the ball in Neighboring Sounds does not count because he does not belong to the world that matters, the Setubal so obsessed with its own segurança that its vigilance becomes a kind of oblivion.